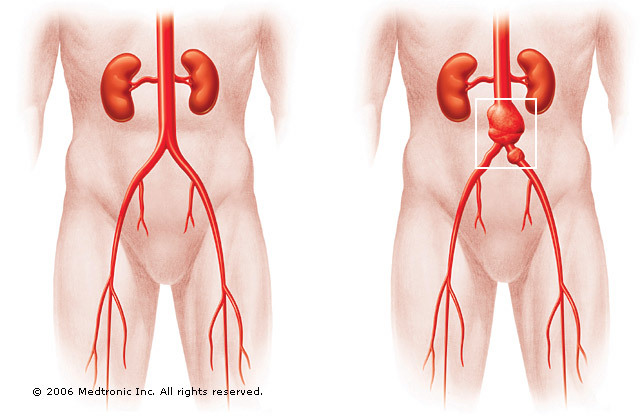 What Is Abdominal Aortic Aneurysm? Home > What is Abdominal Aortic Aneurysm? An abdominal aortic aneurysm is a focal stretching or ballooning of a blood vessel (usually an artery). 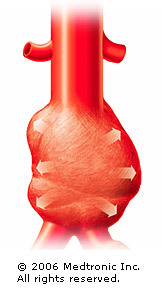 The aorta is the largest artery in the body, the main line for blood pumping out of the heart. An abdominal aortic aneurysm (AAA) is a ballooning of that large artery in the abdomen, a dangerous condition. A thoracic aotic aneurysm (TAA) is a similar ballooning of the artery in the chest. Without proper detection and repair, the prognosis for AAA or TAA is fatal. The most common cause is atherosclerosis (hardening of the arteries, associated with cholesterol deposits). AAA occurs in about 1% of men who are 60 years of age or less. The frequency increases to about 6% of men by the age of 80. The incidence is slightly less in women. TAA is less common, affecting less than 1% of men and women; however, a rupture of a thoracic aneurysm has a greater than 97% fatality rate. Most experts agree that over the past 30 years both thoracic and abdominal aortic aneurysms have become increasingly common. AAA’s develop slowly over years and usually have no symptoms at all while developing. When they reach a diameter of over five centimeters (about two inches), the risk of fatal rupture increases. 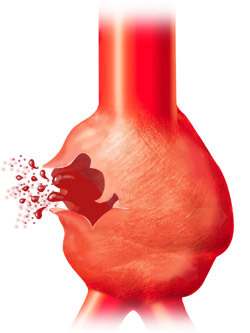 A rupturing aneurysm may cause symptoms of abdominal pain or rigidity, rapid heart rate, nausea and anxiety. A rapid loss of blood pressure (shock) may follow. Sudden rupture of an AAA is associated with a high death rate. An aortic aneurysm may be discovered by chance during a medical exam or on a CT or Ultrasound scan. They may also be detected in older or high-risk individuals by a screening program. If detected in a timely manner, the prognosis for an AAA or TAA can be positive. To ensure this, the interventional radiologist will follow it at regular intervals with an imaging surveillance program (CT or ultrasound scans every six months) and repair it before it becomes lethal. The prognosis for an AAA or TAA isn’t always fatal if detected and repaired in time. Learn about two methods of repairing an abdominal aortic aneurysm or contact us for more information on our aortic stent procedures in Chicago, Illinois.